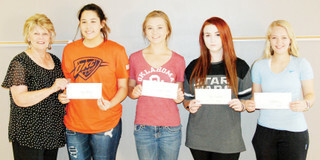 Sophomore essay winners for Platonic Club. Cash prize awards presented by Mrs. Dearing are 1st place Kylee McDaniel, 2nd place Jasmine Boyett, and a tie for 3rd place Halie Sanderford and Jolie Baker. The Annual GFWC Platonic Club Essay Contest was held recently with eighteen freshmen and nineteen sophomores participating in the dual contest.